It’s taken me a long time to try Peters Yard crispbreads but when a free box arrived in my goats cheese delivery from Brockhall Farm (best goats cheese EVER) just before Christmas I had a nibble and was immediately hooked. Those wafer thin biscuits are SO good with cheese and a dollop of chutney but MY GOD they cost a bloody FORTUNE to buy. The only logical option was to make my own and by my second attempt I had perfected the art of getting wafer thin crisp breads that have the perfect snap to them and are boosted by a selection of my favourite toppings. So the crisp breads are perfect and what about the topping? Well the fab folks at The Wasabi Company sent me some of their fresh wasabi rhizome that they grow down in Dorset, along with a plant for me to plant and grow myself (whoop!). I used to use lots of fresh wasabi when I lived in Japan, we would grind some on a piece of shark skin at my friend’s sake bar in Kyoto and sip sake in between doses of wasabi or miso paste. 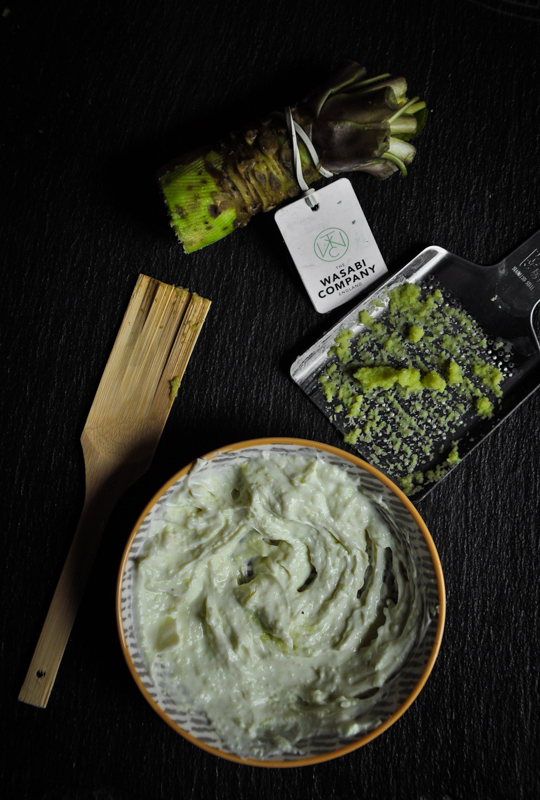 The tubes of “wasabi paste” that you buy over here are made up mostly of regular horseradish and only a tiny percentage of actual wasabi so finding out that it’s grown right here in the UK was a revelation, thanks Pam Lloyd and Polly Akielan! In a large bowl combine the flour and salt. Mix the water, yeast and honey in a jug then mix into the flour. Cover with cling film and leave in a warm place for an hour. Heat your oven to 220C. 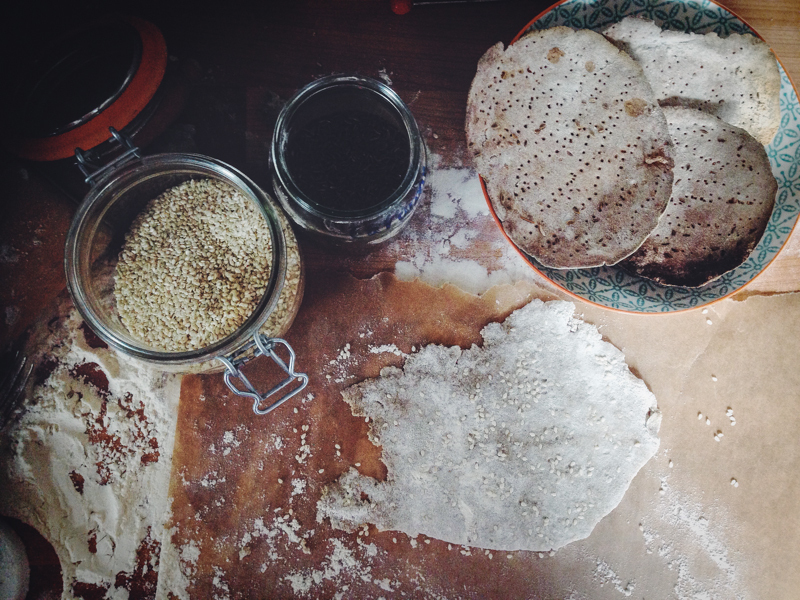 Get a sheet of baking paper and lie it on a flat baking tray, flour it lightly. Take a small bit of dough (about the size of a ping pong ball), flour it well and also your hands. Put it on the baking paper and make a fist. Start to hit the dough with the flat side of your fist from the centre of the dough outwards, stretching it by pounding, keep it nice and floured. Once very thin sprinkle a topping on and hit it to embed with your fist again then prick it all over with a fork..
Repeat that until your baking sheet is full then bake for around 8-9 minutes or until it is crisp. Repeat the process until all your mix is used up. These keep in a sealed tin for a few days easily. This bit couldn’t be easier, simply grate your fresh wasabi and stir into cream cheese, yep that’s it. 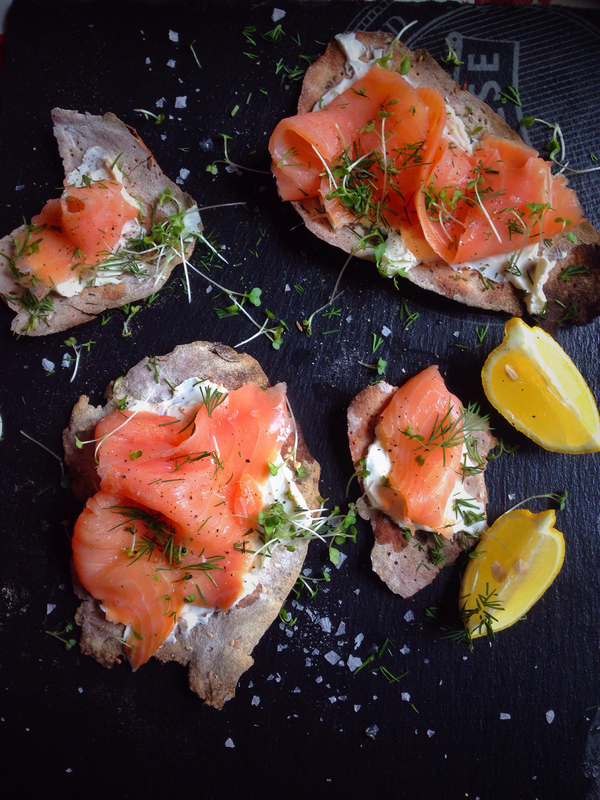 Spread your cream cheese on the crispbread, top with smoked salmon, a squeeze of lemon, some freshly ground black pepper, sea salt flakes, chopped fresh dill and cress. So easy and so addictive.